It was never my expectation, when I started my blog, that I would meet such spectacular people and be nominated for an award by a young lady with such style, elegance and intelligence. anujalipsa.wordpress.com Thank you so much Anuja. * Answer the 10 questions given to you and come up with the same amount of questions for your nominees. * Pass the award on to 7 other bloggers of your your choice and let them know that they have been nominated. 1. What has been the best and worst time of this year till now? The best has been meeting these wonderful people on wordpress. The worst has been the astonishing amount of people who will email me and ask me for money. 2. What is the one thing that you would like to change about yourself? I would like to be healthier, physically and mentally. 3. What is one item that you’ve gotten rid of that you wish you would’ve kept instead? This answer I am not sure exactly fits the question but most summers I have had a garden on my patio and this year I do not (with the exception of a couple that just came up from last year, on their own) I miss not having a garden. 4. Which is your favorite novel and why? Fahrenheit 451 by Ray Bradbury (published in 1953) It presents a future American society where books are outlawed and firemen burn any that is found. Words came very difficult for me and still do (in written form) due to dyslexia. As a result of this struggle I would be outraged if indeed that was to happen. In fact I think this does happen in some parts of the world. 5. What is your favorite quote and by whom? “Our lives begin to end the day we become silent about the things that matter.” by Martin Luther King Jr.
6. One thing you’re dying to do? Two place have equal desire – go on a safari and travel to India. 7. If nothing stood in your way, what profession would you be in right now? International Humanitarian Lawyer; one with ethics. 8. What has been a life changing event for you? I left home at age 13 because I felt I had to to protect myself. Unaware that I was jumping from the fire into the frying pan. 9. What is your biggest achievement? 1. CRUELTY UNDER THE SHIELD OF THE LAW AND IN THE NAME OF JUSTICE because it was the 1st and so difficult to write and get up on a blog. 1. Where would you like to live besides where you are living now, and why? 2. Who do you admire most in the world, someone you know or know of, and why? 3. What is your first memory? 4. What is your worst habit and is it possible to turn it into a positive? 5. What is the sweetest word to your ears (In your language or English)? 7. If you had a “superpower”, what would it be? 8. What makes you laught? 9. Where do you go that gives you peace? 10. What is your favorite colour? 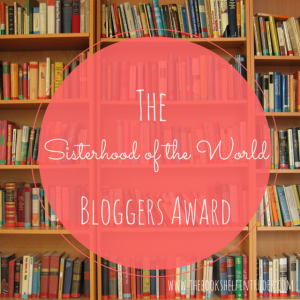 Thank you so very much to Anuja and all the wonderful Sisterhood of bloggers. I’m glad to have cross your path and know you on blogging 🙂 As I’ve said, the pleasure is all mine. Loved your answers. And the post you’ve shared is…. I don’t have words for it… It’s overwhelming! I am so inspired by the younger generations and I think one of the things I like so much is meeting and exchanging with people on wordpress. It gives comfort to know that wisdom comes not just to the older people. I’m glad to know that 🙂 Everyone can learn from each one.